Harmony is born out of a genuine empathy for the horse and a compassionate awareness of the mental and physical impact of the work on the horse. The horse's weight is distributed over its haunches and forehand. Because of the heavy head and neck, the horse carries a greater amount of weight on its forehand. When in motion, the horse uses its head and neck to influence its balance. One of the key elements of dressage is improving the horse’s balance. By teaching the horse to carry more of the cumbersome weight of the forehand with its haunches the forehand lightens and makes the horse more agile and balanced. In order for a horse to carry itself gracefully and most efficiently, it must be permitted to carry itself in a posture that allows for balance to improve. 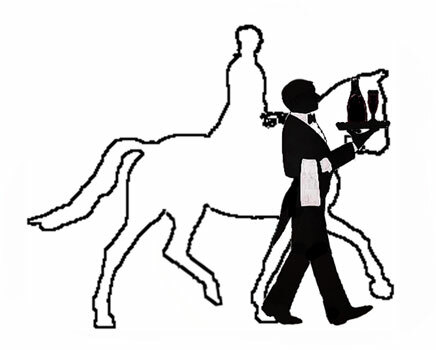 The rider must tactfully help the horse find the posture where the haunches are best able to help lift and carry the mass of the rider and the forehand. As the horse engages (lowers and takes weight) onto its haunches it must be free to bring its poll to the highest point and its nose slightly in front of the vertical. The horse uses this position to help distribute the weight rearward. The horse offers correct posture as a result of balance and relaxation. The appearance of a “correct frame” can be created by force but the horse's posture will not be an honest reflection of its state of balance and relaxation. Tranquility is a hallmark of classical work. The horse is vigorously active, yet the work has an obvious resting quality. This freedom from tension allows the muscles to work most efficiently. It is possible for a horse to lighten its forehand while its nose is behind the vertical but the imbalance this position creates causes stiffness and tension. Because the horse is out of balance, it is impossible for it to rest into its work. Because this horse is balanced, he is able to hold this position and rest into this posture for a brief period of time. Because this horse is unbalanced, she tires quickly - and is unable to hold this position for any length of time. She certainly cannot rest into this position! Balance and rest complement each other. The horse can find its balance most efficiently when free of tension. Yet, as the horse’s balance improves, tension diminishes. This is why rhythm and relaxation are the first two steps on the training scale – the very foundation on which the remainder of the work is built. Johann Meixner, Richard Watjen, Col Handler, Nuno Oliveira and Egon Von Neindorff, are a few of the riders who have left us wonderful examples of balanced harmony that are well worth studying. When the horse’s nose is behind the vertical, the thrusting energy of the hind legs does not travel through to the poll. It only makes it to the spot in the neck where the vertebra are ‘broken’, at which point the energy is stifled by the heavy head and remaining neck that are hanging downward off the front. The weight of the already overburdened forehand is increased. Lifting of the forehand becomes more difficult and the imbalance creates tension, diminishing the performance. Additionally, tension is required for the horse to keep its head behind the vertical. Either the horse must use incorrect neck muscles in order to hold the position or the rider must actively hold the horse behind the vertical. Either way, working with the face behind the vertical is an unnatural way of going for the horse that creates imbalance and tension. Imbalance and tension are the opposite of what we are trying to achieve in dressage. Bringing the head and neck of the horse downward and inward adds significant weight to the forehand. The horse finds it impossible to use its haunches to carry its mass with ease. As a result, the hid legs trail behind the horse, pushing the mass along. Out Behind: The stifle of the red horse’s hind leg has already fully extended. Very little energy can be used for lightening the forehand. If the haunches are out behind when the horse is pushing off with its hind leg, the majority of the energy is sent forward and downward. Engaged: The stifle of the black horse’s hind leg has yet to extend, storing plenty of energy for lifting. When the horse is relaxed, aligned and reaching for the bit, his spine stabilizes and can become essentially a projectile, launched by its haunches. The thrust travels from the horse’s hind hoof, through the back, withers, neck and poll. The poll has to be carried up out in front (as the leading tip of the projectile), propelled by the haunches, through the spine, in line with the flow of energy. When jumping, the horse raises his center of gravity (•) to the point where his haunches can propel him over the obstacle. The horse must be free to raise his head and neck to facilitate the displacement of his center of gravity. As stated earlier, the horse’s weight is distributed over its haunches and forehand. However, because of the heavy head and neck, the horse carries a greater amount of its weight on its forehand. 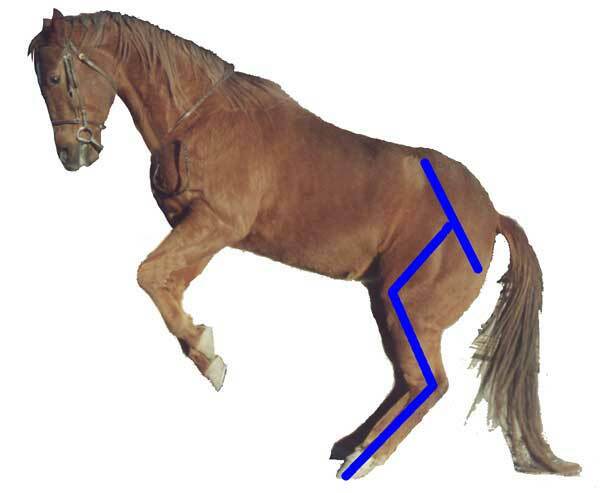 The horse’s center of gravity is located slightly above and behind its elbow (blue dot). To improve the horse's balance we need to encourage the horse to carry more of its weight with its haunches or, in other words, engage its haunches. Equilibrium is maintained by controlling the body's center of gravity over its base of support. The bending of the hind legs - When the horse is working in a relaxed manner and his back is elastically pulsating, the driving aids can be used to encourage pure impulsive ground covering strides, which in turn cause deeper bending of the joints of the hind legs. The shortening of the base of support - In the beginning of the horse’s training, gymnastic exercises are used that increase the bending of the horse’s spine and the bending of one hind leg at a time. These exercises would include work on a single track such as circles, serpentines and other bent lines. Later, greater bending is developed with the use of shoulder fore and shoulder in. In more advanced training, exercises that bend both hind legs (halts, transitions, rein-backs) are used. These gymnastic exercises encourage the more deeply bending hind legs to work further forward toward the horse’s center of gravity and shorten the horse’s base of support. This causes the forward impulse of the hind legs to travel through the horse's body and act on the forehand in a more forward/upward direction. In addition, the shortening of the horse's base of support shifts more weight to the haunches. The lowering of the spine posteriorly - As the horse’s strength develops, the deeper bending of the hind legs causes the spine, which naturally slopes downward from the hips to base of the neck, to lower posteriorly. In exceptionally strong and well-conformed horses the point of the hip (green dot) can eventually lower to a point below the joint between the first thoracic vertebra (back) and last cervical (neck) vertebra (yellow dot). Because the horse’s spine is somewhat rigid, the horse’s haunches do not ‘sit’ independently from the forehand. Instead, this rearward spinal tilt shifts more weight onto the haunches. Bending of the haunches to this degree requires an extraordinary amount of strength and suppleness. The elastic tension of the lifter muscles - As the horse's muscles alternately flex and relax more deeply, the bending of the hind legs and shortening of the base of support create an elastic tension (not to be confused with tightness or constriction) in the muscles and ligaments that connect the haunches to the forehand. This elastic tension helps to lighten the forehand in a kind of cantilever action. Natural raising of the neck - The elastic tension of the muscles and ligaments bring the horse’s neck up into a graceful arch, with the poll balancing as the highest point and the head hanging naturally by gravity from an elegant upward/forward reaching neck. The horse naturally raises its mouth to a point approximately level with its hip and its face approaches the vertical. This naturally offered posture allows the rein aids to travel freely through each vertebra, through the pelvis, down to the hind pastern joints. With the neck stretched upward and the poll carried poised like a ballet dancer, the heavy weight of the head and neck is shifted toward the haunches, making it easier for the back to lift the forehand and the hind legs to carry the weight. Relaxing and bending - the key factor that enables the hind legs to bend more deeply under the increased weight. Engagement becomes easier for the horse as it gets stronger and its balance is refined. As the horse willingly relaxes into the work it will naturally offer to bend its hind legs as much as it is able. As the horse relaxes and settles onto its hind legs, the hips and stifles bend even further. Again, this shortens the base of support and further lowers the spine posteriorly and naturally continues to draw the head and neck into a position that enhances the horse's balance. The haunches are methodically strengthened until the forehand can be easily lifted completely off of the ground and the horse can momentarily settle onto its hind legs. Essentially, the horse's spine rotates longitudinally around the horse's center of gravity. In the piaffe, the combined center of gravity of the horse and rider is directly over the center of the horse’s base of support. In the piaffe, the sensitivity of the horse’s balance can be compared to a scale for weighing gold, which is so precise that its balance can be disturbed by the mere weight of a hair. Compare the trots of a horse in a free, open working frame and a horse is an artificially collected frame. Both of these horses are in the push-off phase of their stride. At first glance, the artificially collected horse appears to be working more up hill but if you take a closer look you will see that the horse in the more open frame is swinging through and pushing off from behind far better. The hind legs of the horse in the free open frame still have some bend, giving them upward spring power as the horse pushes off, while the hind leg of the horse in the artificially collected frame has fully extended – the spring has sprung – and has no more upward thrust to contribute. 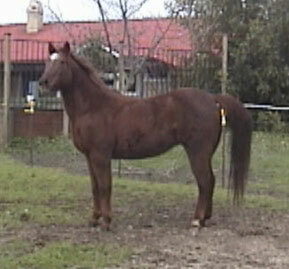 Moreover, the constrained neck blocks the full forward swing of the hind legs. Here, the hind leg lands and begins to compress a fraction of a second before the fore foot. The forehand continues to travel forward, drawing the horse’s center of gravity forward with it. And as the center of gravity continues forward the haunches are no longer in a position to help carry the forehand. This horse is also struggling against the imbalance of the rider. This rider has collapsed his front line and is absorbing the horses movement in his upper body, which in turn diminishes the horse's movement. If the rider were poised and carrying himself in balance the horse would have a much easier job. After the hind leg compresses, it begins to extend, sending the mass of the haunches forward and upward. At this point the forehand is unable to take advantage of the energy from the haunches because the forehand is out of sync with the haunches. The forehand is essentially compressing as the haunches are extending. The rider's position looks a little better in this frame because the horse's body lowers in this phase of the stride, but the riders straight position is deceiving because the rider is still loose in his upper body. As the horse's body rises upward, the rider again collapses in his upper body to absorb the motion. This ricochet motion of the rider works against the motion of the horse, diminishing the horse's gaits even further. Here the haunches trailing behind. The hind leg has extended completely and the base of support is so far out behind the top of the limb that the thrust can only push the body forward as the croup alone is lifted. Because the haunches are not engaged, the horse is hollow behind the saddle. The forelegs now must carry their own weight in addition to the weight of the horse’s head and neck and the rider. Because the haunches are pushing the mass forward, the hoof (the base of support) slips backward and upward. Instead, the hind hoof should provide a solid foundation for the haunches to spring off from and then recoil forward and upward. Hind leg recoiling forward and upward. When the horse’s stifle extends before the shoulder is ready to catch the lift, the shoulders miss the lifting wave of energy created by the haunches (throughness), granted if only by a fraction of a second but they still miss the wave. The forelegs will be doing all of the lifting of the front end on their own. The horse is on the forehand. The ‘forward and down’ exercise is important because it helps the horse learn to step through its spine as it reaches for contact. Additionally, this lengthening, reaching quality steadies the spine, giving it the stability to be propelled efficiently. Bringing the horse behind the vertical shortens and destabilizes the neck. If the neck becomes more bent than the natural arc, or becomes too flexible, the arc basically gets jackknifed and the spine looses its stability. Trying to drive the horse forward with a crooked and/or over bent spine becomes like trying to push a soggy spaghetti noodle forward from the end. The horse cannot be through. Asking a horse to carry from behind while its face is behind the vertical creates an undue burden on the horse. This is why, when ridden with its face behind the vertical, the horse will almost always travel with its haunches out behind. In recent years a number of training systems have surfaced with exercises that claim to "supple the neck" or "soften the mouth" by bending the horse's neck around in various positions. This practice actually destabilizes the base of the horse's neck, taking away his ability to use his neck to assist in the lightening of his forehand and the engagement of his haunches. 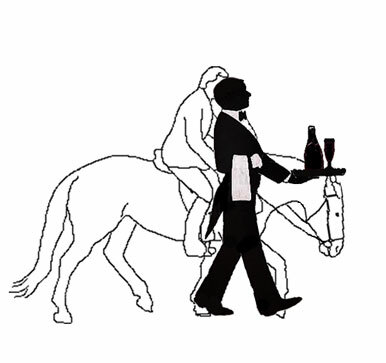 But by nature, the horse’s neck is sufficiently flexible for ridden work. The horse can easily reach around with its head and bite at a fly on its hip. Stiffness and resistance in the ridden horse is most often caused by imbalance and anxiety. “Why is my horse stiff?" "Am I giving the appropriate aids?" "Are my aids correctly timed?" Once these questions are sufficiently addressed by improvements in the rider and by progressively strengthening and balancing the horse, the horse automatically regains its natural flexibility. The neck does not need to be manually cranked around in order to make the horse more "supple". The rider is usually the greatest contributor to the horse’s stiffness and resistance. It’s up to the rider to find out what, within himself, is causing the horse’s stiffness and resistance and to sufficiently address those issues. Only then is it possible for the rider to help the horse restore its natural balance and freedom of movement. 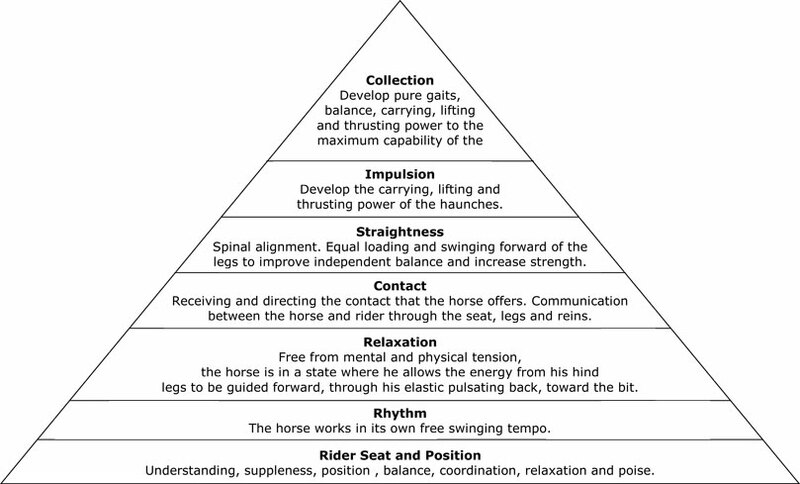 Then, from there, the rider can continue to strengthen the horse with the appropriate exercises that further improve the horse’s trust, balance and gaits.